signed and on verso inscribed "EL58.63.32"
French Impressionism played a strong role in the development of modernism in Canadian art, opening up a new approach to colour and atmosphere. William Clapp initially studied in Montreal under Canadian Impressionist William Brymner, who encouraged him to travel to Paris to experience the Impressionist movement at its source. 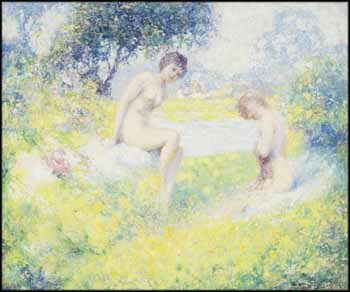 Clapp traveled there in 1904, and this experience galvanized him - there he crystallized his style, based on the pastel palette and broken brush-strokes of Impressionists such as Claude Monet, and the Pointillist technique of Neo-Impressionists such as Georges Seurat. He remained loyal to this style for the rest of his life, as embodied in Two Nudes in a Landscape, which glows with colour and light. Warm yellows and pinks envelop the two figures, and even the tree seems to bend over them in a protective gesture, creating a lush and intimate atmosphere of sensual delight. Clapp's works are in the collections of the National Gallery of Canada, the Montreal Museum of Fine Arts, the Musée national des beaux-arts du Québec and, in the United States, the Oakland Museum of California and the Smithsonian American Art Museum.